Why do some museum/exhibit/design projects succeed while other projects either spin their wheels for years or just crash and burn? I've been thinking about this a lot lately since almost all of my current work involves "start from scratch" projects set up to create entirely new museums or installations rather than adapting or designing experiences for existing institutions. One of these start-up projects, in particular, is operating under the long shadow of a recent design process that failed, and that left a lot of bad feelings (and canceled checks!) behind. So now, in addition to working hard to create a successful new project, our design team is constantly beating back the ghosts of past mistakes in the minds of funders and stakeholders. One thing that's been helpful is to differentiate the parts of our current creative process that are not related to the "pain points" the client team and stakeholders have experienced previously. It really boils down to a few essential elements. Are your design ideas based on community input with a mind toward project sustainability (economically, operationally, ecologically) or are you just chasing fads? There was a time when every new museum seemingly had to open with an IMAX theater and/or a huge traveling exhibition space whether those business models made sense or not. I love the Make(r) Movement but just slapping a "Make" sign on your old recycled art space because "Maker Spaces" are cool is a bit like putting old wine in new bottles, isn't it? The true spirit of a sustainable and evolving Maker Space (for example) has to involve the work of connecting with local tools, people, and resources, not just latching onto the buzzwords. Is one person's (or one group's) ego constantly driving the creative process? There should be no shortage of strong opinions that get batted around during a project, but at the end of the day, are the final decisions that are being made project-oriented or personality driven? Are the people in your project group "team players" in every dimension? Do they respect each other? Do they truly want to engage the communities who will visit the museum? Do they look for ways to creatively partner with other museums and organizations? Or is everything a "we know best" situation? What Does "World's Best" Mean? I've written posts about this topic before. It is great to set the bar high, but at least know what you're talking about. What specifically would make your new museum "world class"? If you can't meaningfully answer that question, you don't seem aspirational, you seem delusional. Do You Really Need A Ferrari? Do the design solutions you're developing really fit the project and the place where it's located? I sincerely believe that every community should have great cultural institutions, but you don't build a Ferrari when a Ford will do the trick. Find the right tools for the right tasks. No prospective creative partner is perfect, but you owe it to your project to "check under the hood" a bit. Ask your design team to describe a previous project that ran into a snag or two, and what steps they took to address and resolve the challenges. If they can't come up with a credible answer or, worse yet, say that nothing like that has ever come up --- RUN! It's easy for everyone to be happy and excited at the beginning of a project when the schedule and budget seem great, but what happens when you all hit that first big pothole together? Let's finish where we started --- talking about sustainability. Is your project built to last? Are you creating true "internal capacity" (one of my favorite topics!) that will help your organization and your organization's employees and volunteers constantly grow and improve? Or are you happy to throw your lot in with a bunch of "one-stop shopping" hucksters who will promise to do all the hard work for you as long as you keep writing checks? I can show you many new(er) museums that, just a few years after they opened, are sorry they made that choice. What do you think? 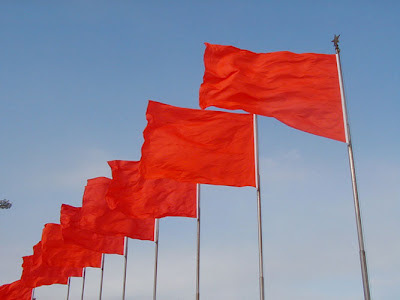 Did we miss any important "red flags"? Let us know in the "Comments" Section below!